Mike Riccetti is the author of “Houston Dining on the Cheap”, the local Zagat editor and a regular contributor to “My Table”. He writes frequently about food, drink and some less important topics. He recently attended a dinner at the Valentino restaurant in Las Vegas. More than a dinner, because if you see who attended, it seems to be more of a culinary gods symposium. So, he went to this dinner and heard Piero Selvaggio describing an “obscure ingredient”, the colatura di alici. Selvaggio said replacing the anchovies or anchovy paste with some colatura makes for an even more enticing and nuanced Caesar Salad. It is even easier, too. So, here you are. If you thought this was a secret between you and us, no more. Colatura is going to become the next balsamic, I’m sure. Hurry up to buy it here. 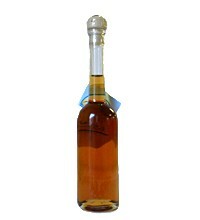 We think we have the only colatura made with anchovies from Italy. If you need recipes and/or suggestions on how to use it, call us in the office at 718 860 2949. And grazie mille Mike Riccetti! Previous Post food52.com: Gustiamo’s tagline is “Italy’s Best Foods” and it’s really true. Interesting discovery. I very curious on how is the taste.